Ko Siu Lan, Don't ask me why. BEIJING.- Galerie Paris Beijing presents the site-specific installations and language based works by artist Ko Siu Lan. Born in Xiamen, China, grew up in Hong Kong, Ko Siu Lan studied Sociology before working for NGOs in China until 2007. She has been making performances, installations, objects and videos for diverse international exhibitions since 2002. Recently completed the prestigious Program La Seine of Ecole Nationale Supérieure des Beaux-Arts of Paris, Ko Siu Lan is now based in Beijing. Everyday ready words and slogans are at the center of her art process. Ko Siu Lan's works create systems that embody multiple layers of perceptions. The works are suggestive of political and ideological incoherency but offer a conceptual openness in sense-making depending on space, chance, and the viewers' physical and mental participations. The messages and objects are constantly in play and meanings in flux. An example would be her controversial public installation recently exhibited at the façade of the Ecole Nationale Supérieure des Beaux-Arts in Paris. The text-based work consisted of two banners with four words 'Gagner'(earn) travailler' (work) 'Plus'(more) 'Moins' (less), inspired by the French president's slogan. Depending on the viewers' position (space) and movement, different sentences/meanings could be derived. 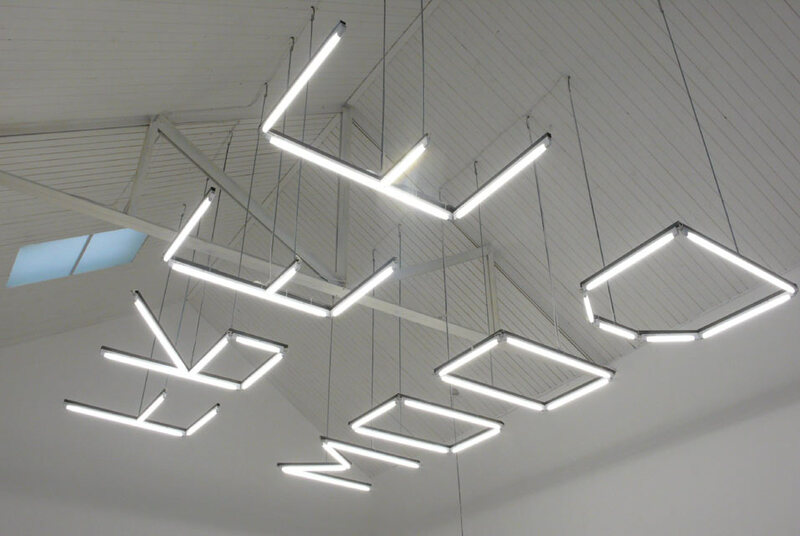 'Don't Ask Me Why', one of the pieces in this exhibition, consists of words created with suspended T5 lights on a support steel substructure. The floating words act as a perceptual play of inverse logic, creating an element of pending fear. An elegantly crafted nostalgia for fear, the image of words and language co-exists as carbon copy. Ko Siu Lan's works make use of the possibilities created by the impossibility of translation. She plays with the misunderstandings and contradictions as a result of the co-existence of different cultures, languages and social systems that stem from her China East and/vs. China West cultural experiences. With a background in performance-based works, her installations often try to engage the viewers in bodily experience. The use of the everyday spontaneous body of the audiences forms part of the message in the works. The site-specific installations acknowledge the architecture as form and function reflecting on the system of public space. "Don't Think Too Much" is a visual, mental, physical interaction with the viewer, a heightened sense of the thinking process, please don't think too much. Archives of American Art's Exhibition Portrays "Hard Times, 1929-1939"
All Visual Arts Presents Jonathan Wateridge's "Another Place"
Museum of Contemporary Art Opens "Here Not There: San Diego Art Now"